The NovelAire ComfortDry 400 Dehumidifier represents a radical departure from the technology commonly used in whole house dehumidifiers. In contrast to the traditional refrigerant process, which condenses moisture on to a cold surface, the ComfortDry 400 uses a desiccant wheel to absorb water from the air. There is no liquid water to collect or drain. The water is driven out of the desiccant wheel by the application of heat and vented as vapour to the exterior of the building. The source of heat is gas, either natural gas or propane, another innovative feature of this dehumidifier. The ComfortDry 400 is installed in a single location within a building and draws in moist air and discharges dehumidified air through ducting. 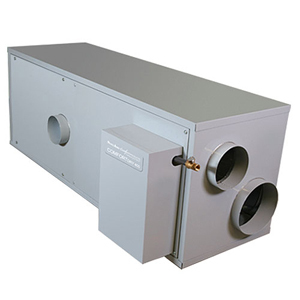 Where an existing air-handling system is in place the ComfortDry 400 can be integrated with the existing ducting although it operates independently of the air-conditioning system. Where pre-installed ducting is not in place the ComfortDry 400 may operate as a stand-alone unit with its own dedicated ducting. The NovelAire ComfortDry 400 is an energy efficient whole house dehumidifier which takes advantage of advances in desiccant technology and innovative design from one of the world leaders in the humidity control industry. It provides an effective and efficient alternative to refrigerant whole house dehumidifiers which are themselves among the highest performing units in the dehumidifier category. The NovelAire ComfortDry 400 uses desiccant technology which offers significant advantages over refrigerant dehumidifiers. Refrigerant dehumidifiers function most effectively at typical room temperatures. This is because ice will form on the cold coils, used to condense moisture from the air, at temperatures as high as 65°F/18°C. Ice formation degrades performance and eventually stops the dehumidifier from operating. Refrigerant dehumidifiers designed for low temperature operation have systems which actively melt the ice, allowing these units to operate at temperatures as low as 33°F/1°C. Even with such systems the unit must stop dehumidifying until the ice has melted, resulting in recurrent periods of "down-time". Desiccant systems can operate at temperatures well below the freezing point of water without the need, or added complexity, of a defrost system. Refrigerant dehumidifiers become less efficient at lower levels of relative humidity, below 50%, and precise control of humidity becomes a problem. A desiccant dehumidifier is capable of lowering humidity, both relative and specific (i.e. absolute) to much lower levels so is capable of controlling moisture content more precisely at the 45% to 55% RH level recommended in the home. If lower levels of moisture are required the ComfortDry 400 is easily capable of achieving and maintaining them. Precise humidity control is achieved by means of a remotely operated adjustable humidistat. This controls the operation of the unit and is independent of the air-conditioning system so will maintain the desired level of relative humidity at all times. A level of 45% to 50% RH is comfortable for people and low enough to prevent mold and mildew growth. A level at or below 50% will also inhibit dust mite infestation as these allergen producing bugs prefer a moist environment in which to live and breed. A whole house dehumidifier is inherently more energy efficient than one or more room dehumidifiers because larger units remove more moisture per kilowatt hour than smaller ones. The cost of operating a whole house dehumidifier is also partially offset by the energy savings than can be made on operating air-conditioning systems. This is because the temperature experienced by the human body at higher levels of relative humidity is higher than at lower levels. The body's cooling system is evaporative, we sweat. When relative humidity is high sweat cannot evaporate so quickly so our body temperature is higher. At lower levels the sweat evaporates more quickly. Maintaining relative humidity at or below 55% will allow the temperature setting on an air-conditioning system to be raised 2 to 3 degrees, saving energy while retaining the same comfort factor. The NovelAire ComfortDry 400 is an energy efficient unit compared with many others and provides an additional benefit for residents of some areas where gas company rebates are available for shifting air-conditioning loads from electricity to gas. Desiccant dehumidifiers are more reliable than refrigerant units because of the simplicity of their design. The ComfortDry 400 consists basically of a desiccant wheel, two fans and the gas burner. The high-tech element is the desiccant wheel and this is intended to last for the life-time of the unit and comes with a five year limited warranty. It is the refrigeration system of a refrigerant dehumidifier which makes these appliances notorious for breaking down within a relatively short time. Leakage of the refrigerant, compressor failure and cumulative deposit of fine particles on the coils are the major causes. Desiccant dehumidifiers have typically had lower moisture extraction rates than their refrigerant cousins but the NovelAire ComfortDry 400 competes well with a rate of 150 pints per day. This rate was tested at the AHAM (Association of Home Appliance Manufacturers) specified conditions of 80°F (27°C) and 60% relative humidity. This compares well with most refrigerant whole house dehumidifiers which, of course, cannot match the ComfortDry 400 at very low temperatures and/or relative humidity levels. Installation of the NovelAire ComfortDry 400 is simple and typically takes between two and four hours depending on circumstances.